Location/ Directions: From the North, South, and West: Come to I-10 and travel eastbound. Exit John Ralston Rd/Holland Ave (Exit No 776B). Drive past the first traffic light. The hotel is adjacent to a strip center, 1/4 mile past the traffic light, on the right. From the East: Come to I-10 and travel westbound. Exit John Ralston Rd/Holland Ave (Exit No 776B). Make a U-turn at traffic light, and drive 1/4 mile and the hotel is on the right, adjacent to a strip center. About Hotel: 3-Floors, 74-Rooms, Interior Corridors, Free Buffet Breakfast, Free Morning Newspaper, Coilor Cable / Satellite TV, CD Player, DVD Player, Work Desk w/ Lamp, Speakerphone with Voice Mail, Free Local Phone Calls, Bathrobe, Bathtub, Hairdryer, Private Bathroom, Tea/Coffee Maker, Microwave, Mini Refrigerator, Connecting Rooms, Crib, Double Glazed Windows, Individually Controlled Air Conditioning, Iron / Ironing Board, Rollaway Bed/Cot, All rooms non smoking, Business Center, Health and Fitness Center (On-site), High-speed Internet Access, Outdoor Pool, On-site Guest Self-Laundry Facilities (washer/dryer), Daily Housekeeping, Ice Machine, Gift Shop, No Pets Allowed. Railroad View: Fair Distant View. Ask for a 3rd floor room on the rear of the motel. The railroad is along Market Street Road. 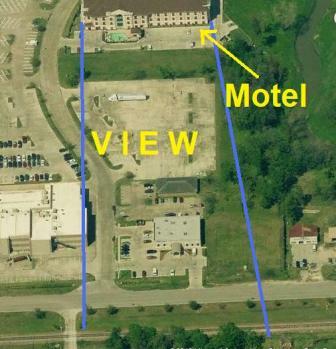 Photo Comment: The aerial picture shows the Holiday Inn Express at the top of the photo. The single track train is seen along the bottom of the picture. The distant view is narrow as marked by the blue lines. Those two single story buildings will lessen the view of the railroad from 1st & 2nd floor rooms. 3rd Floor will be the best choice. About Hotel: 1-Floor, 30-Rooms, Exterior Corridors,Alarm clock, Telephone, Cable TV, Free Wi-Fi, Free Parking, Vending Machine, 24-Hour Front Desk, Wake-up service, Heating, Air Conditioning, Pets are not allowed, Breakfast included, Refrigerator and Microwave. Railroad View: Good View. Some bushes in front of the motel prevent an excellent view. Photo Comment: A photo taken from Sowden Road shows the single track Union Pacific Railroad line, Hempstead Road, and the Budget Host Inn motel. The bushes in the photo will prevent a encellent view from the rooms, additionally the busy automobile / truck traffic on Hempstead Road may additionally foul what could be a clear view of the railroad. Location/ Directions: From: Highway 290 East. Exit onto FM 1960 and Highway 6. At the stoplight, turn right. Stay on the service road and make a u-turn under the bridge. The BEST WESTERN Windsor Suites is on the left-hand side. 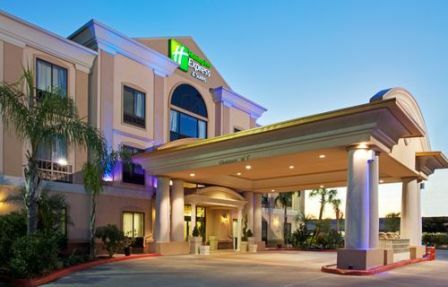 About Hotel: 2-Floors, 59-Rooms, Exterior Corridors, Free Hot Breakfast, 42" LCD TV, Fitness Center, Hot Tub, Outdoor pool, Spa, Guest laundry, Ice/vending machines, Free parking, Truck/RV parking, Cable satellite television, Microwave, Refrigerator, Coffee/tea maker, Free local calls under 30 minutes, Free high-speed Internet access, Hairdryer, Iron/Ironing board, Air-conditioning, Voice mail. Railroad View: Excellent View! Any room on the railroad side of the building will offer a great view of the railroad. 2nd Floor rooms will keep you above the parking lot. Photo Comment: Best Western is the building seen in the photo. Guests on the railroad side of the building should have a clear view of the railroad. 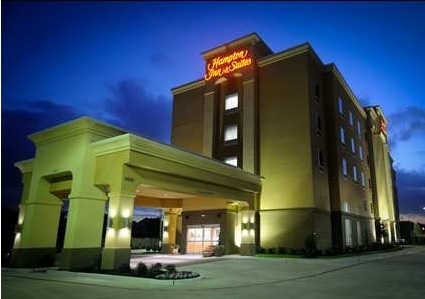 Location/ Directions: From I-10: Exit 764 Washington Avenue, at hotel turn, enter through Denny's. About Hotel: 4-Floors, 99-Rooms, Interior Corridors, Non-Smoking Hotel, Free Self parking, No Pets allowed, Business Center, Cribs, High chairs, Free Breakfast Area, Coin Laundry, Elevators, Local Area Transportation, On-Site Convenience Store / Snack Shop, Fitness Room, Pool, Easy to Set Alarm Clock Radio, Ergonomic Desk Chair, 37-Inch Flat Panel HD-TV, Coffee Maker, Hairdryer, Free High Speed Internet, Iron/Ironing Board, Lap Desk, Microwave, Mini Refrigerator. Railroad View: Expect a Good View from north end rooms on the east side of the building, 2nd floor or higher is a must to see passing trains. Photo Comment: The large building near the top center of the image is the Hampton Inn. As we look at the back of the building you can see the double track railroad in the center of the photo. This view looks southward, north side rooms are needed for viewing passing trains.